Let’s play a little game. When I say “balance,” what’s the first phrase that pops into your head? If it’s “work-life,” you’re not alone. Finding the balance between your professional dreams and commitments, your family responsibilities, and your personal goals is something nearly everyone strives for and struggles with. For many of us our careers and our families are two of the most important components of our lives – and two of the most difficult to balance. 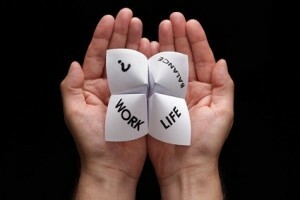 Here are a few simple tips to cultivate work-life balance. Track your time. To make informed decisions about your time, you first have to understand how it’s being spent. Where you spend your time is indicative of what your values. Spend a week tracking how you spend your time, noting which activities are work/career related and which are life/personal related. You might be surprised at the results! You can also use this tool to eliminate things that don’t align with your priorities. Focus on one thing at a time. Multitasking makes you feel like you’re getting more done – but it can also leave you feeling scattered, like you’re doing nothing well. So when you’re working, work. When you’re with your family, give them your full attention. This helps keep you from neglecting your job and your relationships – and helps keep you from feeling like you’re constantly working and constantly falling short. Turn it off. Constant connection can distract you from your work and from your family. With that in mind, disconnect for a few hours a day at work (no checking email or social media) and at home (put that phone down!) to be more productive at work, show your family they have your full attention, and leave you feeling more refreshed! Work to live, don’t live to work! It’s easy to let our careers take over our lives. After all, they’re how we pay the bills – and for many of us, they’re a huge part of our identity. But that kind of thinking quickly leads to an unbalanced life. Change your perspective by considering the kind of life you want to live, then envisioning the career that fits that life. A simple shift in thinking can lead to immense business and personal success, and allow you to be physically and mentally present when you’re working and when you’re playing. Respect your private time. You wouldn’t skip out on a meeting at work, or ignore an urgent deadline. But do you treat your own time with the same respect? Put important private moments – birthday parties, yoga class, “me time” – on your calendar. Then protect those moments, just like you would your work commitments. Take a vacation. We’ve all heard the stats about how many vacation days go unused every year. (169 million, according to CNBC!) It might feel like a stretch to step away from your commitments for a few weeks every year, but everyone needs a total rest from time to time. You don’t have to go far and you don’t have to spend a lot of money, but you do need to pause to recharge your batteries. You’ll come back to work refreshed and ready to take on the world! This entry was posted in Balance, Mindfulness. Bookmark the permalink.